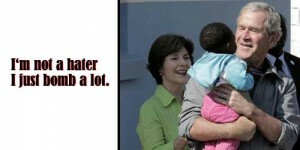 Home › Barack Obama › George W Bush: I love Africans, I just can’t stand Americans. George W Bush: I love Africans, I just can’t stand Americans. How stupid are you? Are you stupid enough to believe what the lying-est dirty sack of roach turds says? Who knows if America will survive what was done to this country during George W. Bush’s REGIME? The majority of people never even elected him to be the president. He was APPOINTED by a majority supreme court RULING once and again under tremendous fraud and controversy. He lied about 9-11. He lied about who were the culprits so he could invade Iraq. He lied about how American troops would be welcomed as liberators by invading another country. He lied about the people he illegally detained all over the planet. He then lied about ordering torture only to confess to ordering torture even though the people who carried out his orders were imprisoned. He did not pardon them. He has proven he is the worst kind of two-faced double crossing criminal snake demon there is. But wait. He wants you to believe he loves Africans. There’s that poker face smirk again, see it? You know you love it. One thing I’m sure of is this man has no love. His history clearly proves the only thing that he wants is more power and control. He wants to invade Africa so he apparently has told Obama to send in the troops while he handles the publicity. Same old crap still works I guess. How long have politicians been seen posing in front of cameras while hugging and kissing babies? Maybe he is running for president in Africa? Does he know Africa is a continent and not a country? I don’t think you should have a “Dirty Mind” per se but you don’t want to be completely brain washed like these idiots promoting this vampire. This is how stupid you look trying to act like you made it big time. Here we are in the middle of the worst depression ever, started by BUSH but you are “invited” to attend the “Bush loves Africa” conference for a low low price of only $2500. Yes, they say it with a straight face . All so you can be told that the troops coming to invade the continent love you like Bush does. You’ll need an elephant shovel for this crap. Everybody wants to be the king but what good does it do to be the leader of a nation of idiots? Why have a brain if you’re not going to use it? What moron really thinks that George W. Bush is after anything different now than he was in 2008 when he was lying about the “Fundamentals of the economy are Strong”. Meanwhile trillions of tax payer dollars was being handed out to his wall street homeboys and the bailout economy was born. What a cold-blooded psychotic deranged individual. What do you think? ‹ Dr. BigPharma is ready to see you now.